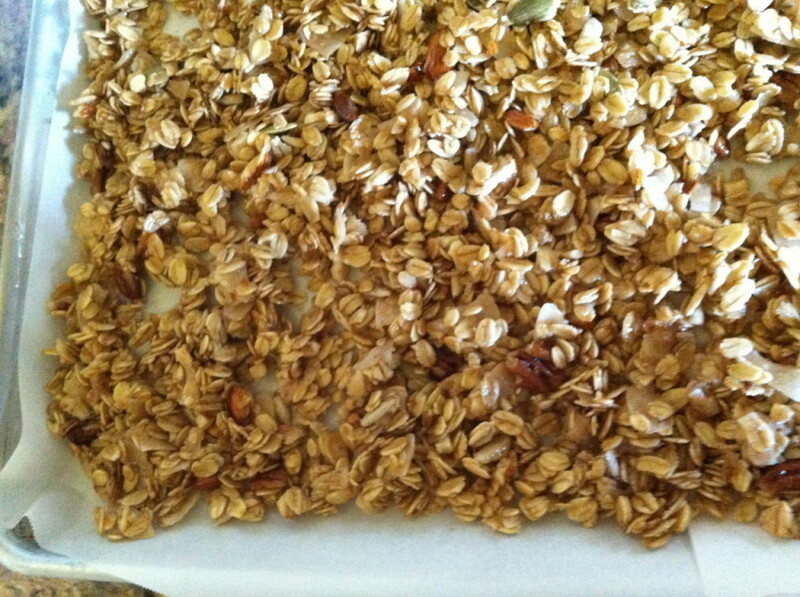 Every now and then we love to make a huge batch of granola, a treat topping for the kids “plain old yogurt”. This recipe is so easy that I don’t even make it, my kids do! The recipe is adapted from the Clinton Street Baking Cookbook. I tweaked the recipe then passed it along to my older boys who now make it themselves. Perfect timing because the younger one of the two was studying fractions at the time. He was having a hard time with it so what better incentive to learn fractions than sweet, crunchy granola that makes this world a better place, right? Right. Way before allergies, we would go to the Clinton St. Bakery Restaurant when we lived in New York and this granola was one of our favorites. Actually, everything they make is a favorite and have you leaving happy, which is why I had to get their cookbook-no allergen is going to stop me from recreating their delicious stuff. I have to tell you it came out foolproof. They baked some seriously delish granola. The toasted maple flavor of the nuts and coconut with the crunchy oats makes everything better, but it’s the orange flavor that makes this recipe stand out from other granola. It doesn’t taste like orange flavored granola, but somehow the hint of orange makes all the flavors stand out and not taste very oats flavored (not a fan of granola that tastes too much like oats). I will warn you this granola can be addictive-you want a bite of the pecan, then the almond, then coconut, a little more oats, a little more toasted…and perfect for satisfying any sweet/salty/crunchy cravings one might have while Netflix binge watching. Just sayin. If you have better self-control (ahem) and looking to jazz up your breakfast, try a spoonful over coconut yogurt with some berries. I also send this as a school snack. And don’t worry about making too much, it goes QUICK. You can swap out the nuts to add your favorite and/or any dried fruit your heart desires; anything goes with this recipe. 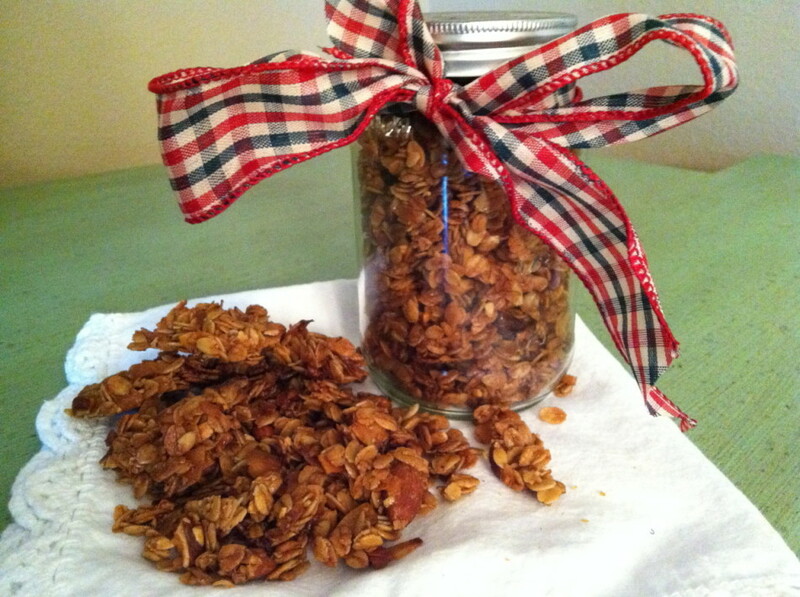 This granola makes a great gift – teacher, hostess, colleague, book club event, etc. 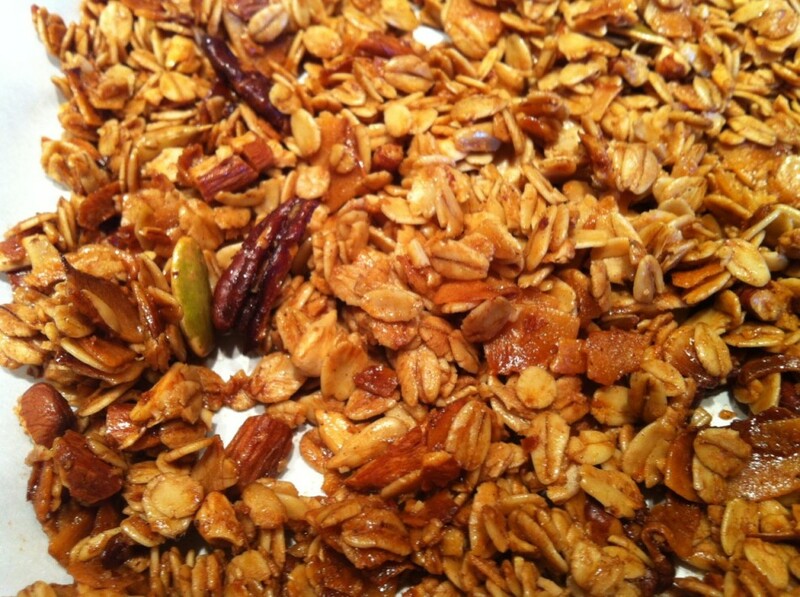 Who does not love some crunchy nutty granola? Full of nutrition with some natural sweetness, your family will love this…enjoy! Makes about 3 quarts – Stored in airtight containers for 6-8 weeks, in a cool, low humidity spot at room temperature. Note: If you like nuts very toasted add 5 minutes to the cooking time. If you like it less crunchy and less toasted, reduce baking time 5 minutes. In a large bowl, combine oats, nuts, salt, cinnamon, nutmeg until well combined. In a medium saucepan over low heat, whisk coconut spread, maple syrup, sugar, orange and vanilla extracts until the sugar has dissolved and spread has melted. Pour the melted mixture over the dry mixture, stir to mix thoroughly. 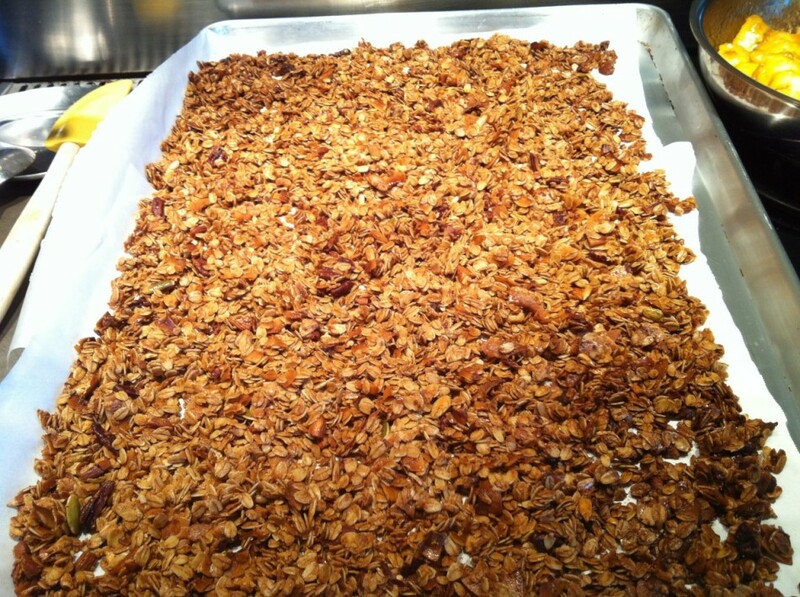 Line a baking sheet with parchment paper, spread granola evenly into a single layer. Bake until golden brown, 20-22 minutes, more or less, if desired as noted above. Rotate the baking sheet halfway through baking time to ensure even browning. Break up the granola using your hands. Then add optional dried fruit. Store uneaten granola in an airtight container. Serve over So Delicious Vanilla Flavored or plain Yogurt, or any Dairy Free Yogurt of your choice with fresh seasonal fruit. My daughter and I made your granola recipe today to nibble on at the movies (we are corn free) with added dried cranberries. It yieled so much we thought to share some with our neighbor, leaving plenty for us. 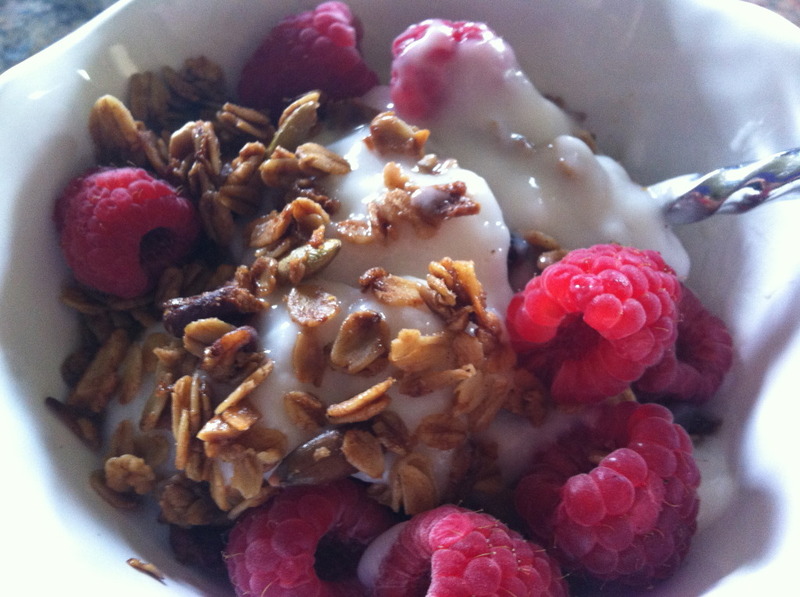 This is one of the best granola recipes I have tried. My kids agree. Your granola looks so healthy and something I think some on my holiday list would love, including me :) I have a friend with diabetes also and hoping you would know if stevia or xylitol will bake well in this recipe and if I half the recipe (sugar free/with sugar) will that affect anything too? Thanks! Nicole, I don't recommend powdered stevia because it has an aftertaste but do love xylitol for a sugar free version. This recipe can be halved or doubled, either way. Enjoy! I've made this 5 times now with variations like chocolate chips and mulberries and am obsessed. I'm bringing a jar over to my brother's house as a breakfast theme hostess gift with your blueberry loaf. You have such yummy recipes with many I make often; thank you for sharing and Happy Thanksgiving! Thank you Monica! 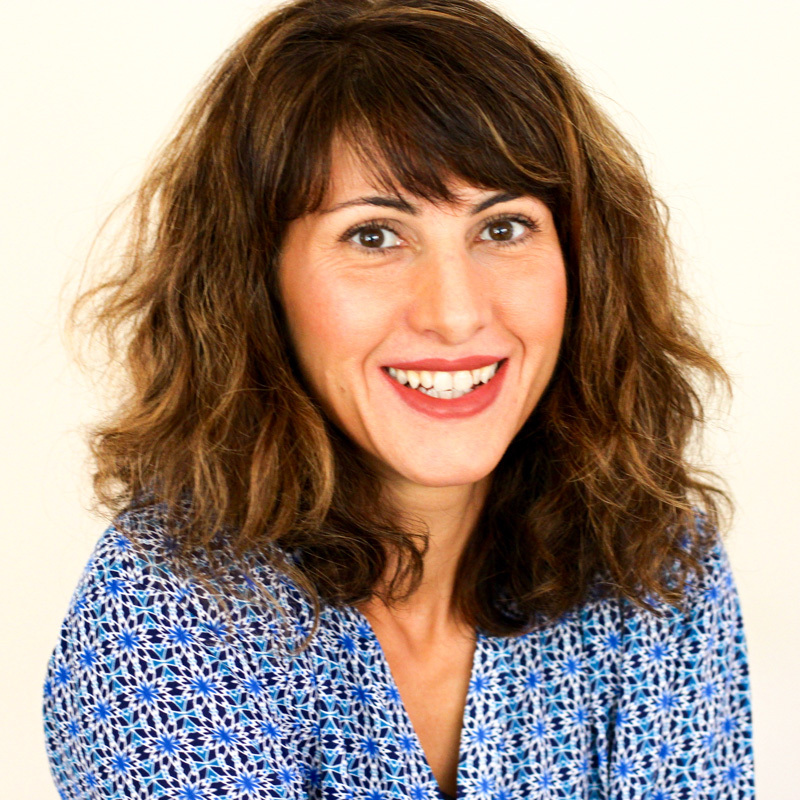 SO happy to hear you enjoy the recipes, it made my day! Happy Thanksgiving to you too!! Made the ginger cookies from your blog that were beyond delicious and have always wanted to make homemade granola. I can't eat oats though, even gluten free oats so I substituted it for more coconut flakes and dried cherries. I also added double orange extract since I'm obsessed with orange. Final result is fantastic granola. Can't wait to make pretty parfaits for a breakfast get together I'm having!